Goodwin Knight wrote a book entitled Good's Budget, which was published when he was 13 years old. In 1904, the Knights left Provo and headed for Los Angeles. Knight became interested in politics when he was a teenager. His first experience in politics was handing out hand bills promoting Hiram Johnson’s first gubernatorial campaign. After graduating from high school, Knight spent a year working in lead and zinc mines in Nevada. He also worked as a newspaper reporter for the Los Angeles News and as a grocery clerk. Knight started his studies at Stanford University in 1915. He interrupted his studies in 1918 to serve in the Navy during World War I. After he was discharged from the service, Knight returned to Stanford and completed his B.A. degree. Knight started studying political science and law at Cornell University, but was unable to complete his studies for financial reasons. He returned to Los Angeles, worked as a clerk in a law firm and was admitted to the California bar in 1921. In 1935, Governor Merriam appointed Knight as a judge on the Los Angeles County Superior Court, a position he held for more than eleven years. He served as Lt. 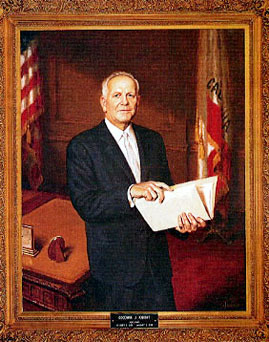 Governor under Earl Warren, succeeding to the office of Governor in 1953. During his term, Knight made major achievements in the area of water conservation and development, including the beginning of the Feather River Project. He also improved the prisons and created the Department of Alcoholic Beverage Control. Knight died of pneumonia in 1970. Use the California State Library’s interactive tool to view Executive Orders and Proclamations signed by Governor Knight.